Discount Magic - Blank Face Bicycle Deck Red Back. 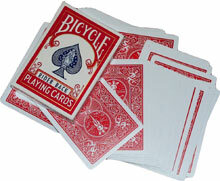 This is a standard size Bicycle Deck (808 poker size), but consists entirely of blank faced cards with a standard Bicycle back design in red. This product was added to our catalog on Tuesday 20 June, 2006. I purchased these to perform Andy Nyman's "The Hidden". Such ..